DataTank Mining | DataTank Mining Operations | Any chip, any hardware, any currency. DataTank Mining Operations | Any chip, any hardware, any currency. Expect an overhaul in 2015 and real-life presentation of physical DataTank mining systems (think containers, farms, greenhouses). See here for further tech details. Let’s see who gets to 500kW per rack first: Supercomputer builders or Bitcoin miners. 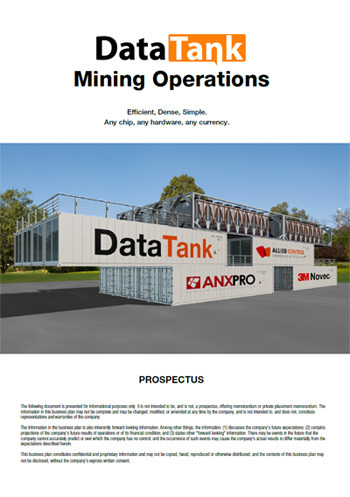 The original DataTank Mining Operations ‘prospectus’ was also replaced with a shorter Introduction to DataTank Mining document in the meantime (the original is kept here for historical reasons). 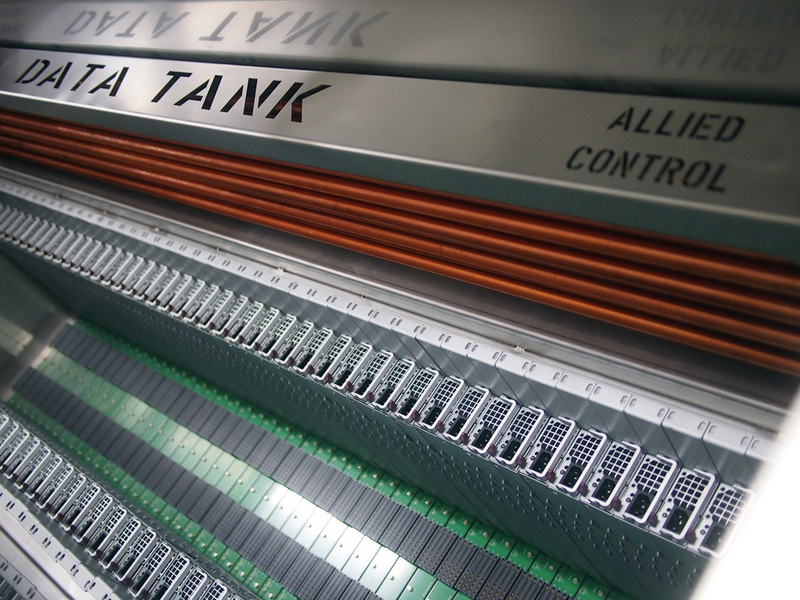 Trivia: DataTank Mining was originally conceived under the name of Endgame Mining. Mining will never be the same again. Please have a look at our prospectus below (PDF). 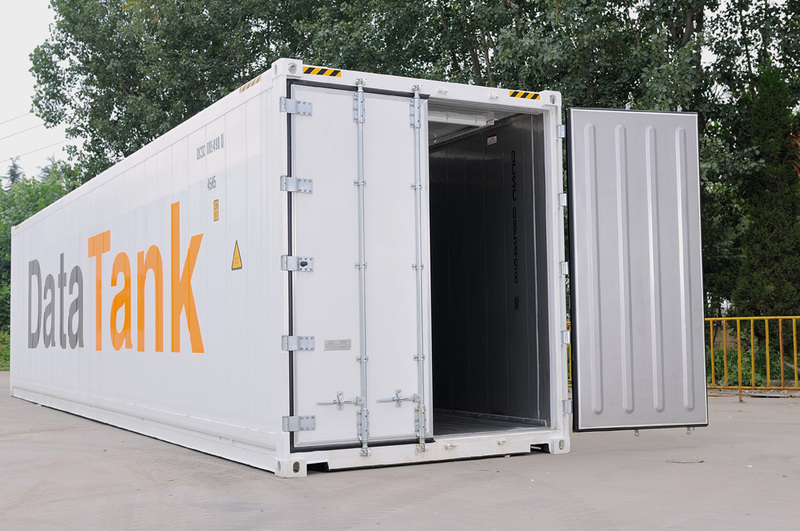 DataTank Mining deploys mining capacity in packages of mining container units with a capacity of an average of 1.2 MegaWatts (MW) or 1200kW at the 12V power output available to mining boards. Therefore, three of the permanent measures of capacity at DataTank Mining are MW, kW (measured at the 12V level) and number of Container Mining Units. In addition to that, there are six (6) tanks in each container mining unit. Each tank currently comes with 100 power supply units (PSUs), delivering 200-240kW (240,000 Watts) 12V output power per tank, which is then used by mining boards. 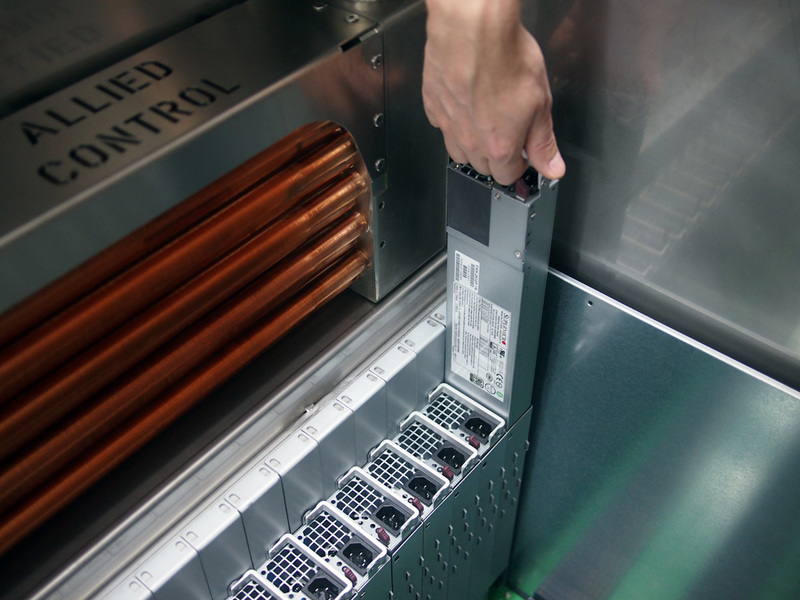 Power supplies are reused and stay in place, but can easily be replaced with different or denser models in the future, including with different voltages (48V). The cooling capacity of a tank is not limited to 240kW and each tank is fed with a dedicated 800 Ampere 3-phase power feed, giving a theoretical power limit of >500kW per tank without any infrastructure changes. These measures of capacity are in contrast to MH/s, GH/s or PH/s or other measures of hashing power. These measures are important to calculate mining income at a certain period of time, but they change depending on network difficulty and currency being mined. What does not change over time, is the available power, infrastructure and cooling capacity. Once installed and deployed, 1.2MW will be 1.2MW, no matter what hardware is deployed or what currency is mined. This can be 2PH of 40nm ASIC chips today, and a lot more PH at exactly the same power consumption in 6-12 months down the road, by simply changing to hashing boards with 28nm chips or a different hardware type altogether (Scrypt mining boards) . The infrastructure does not change for such an upgrade-deployment, it can be carried out within hours as no single cable needs to be connected (boards slide in), and no further investment (except the new mining hardware) is needed. Partial deployments are possible, for instance half Scrypt ASIC and half SHA256 ASIC boards. Including rent, staff, cluster electricity, everything. Compatible with chips from Spondoolies Tech, InnoSilicon, Hashra, HashFast, GridSeed, Cointerra, Butterfly Labs, Bitfury, Alcheminer, Avalon, ASICminer and more. 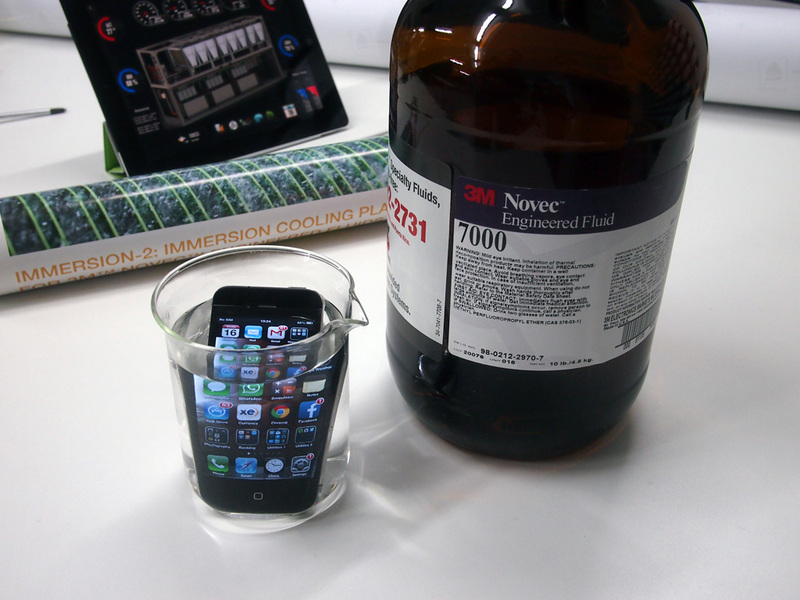 Bitcoin, Scrypt, any other hardware. Including GPU, CPU or FPGA mining. No heatsinks, no fans, no noise, no dust.